Sailing superyacht Comanche has set a new record for crossing the Atlantic Ocean after completing her latest Transat on July 28. The 30.45 metre carbon-fibre yacht sailed from New York’s Ambrose Lighthouse to the UK’s Lizard Point in 5 days, 14 hours, 21 minutes and 25 seconds. This new speed record for a sailing monohull, which is subject to ratification, shaves 27 hours off the previous fastest time previously set in 2003 by Mari Cha IV (which has since been refitted and renamed Samurai). Prior to Comanche’s departure from New York on July 22, skipper Ken Read, president of North Sails, said: “We have been on standby for a few weeks now and have almost left on three separate occasions since the end of June. But now the right conditions have presented themselves.” Read’s media commitments at the 2016 America’s Cup World Series Portsmouth meant he could not be on board for the record-breaking crossing. In his absence, Comanche’s crew was led by Casey Smith. 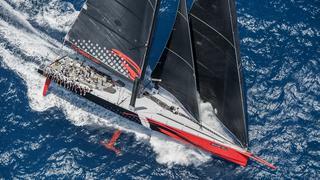 The success of Comanche – the sailing yacht built to win – follows her second place finish at the 2014 Sydney Hobart race. This Transatlantic speed record is just the latest in a remarkable series of records broken by Comanche. Sailing superyacht Comanche has set a new record for crossing the Atlantic Ocean after completing her latest Transat on July 28. The 30.45 metre carbon-fibre yacht sailed from New York’s Ambrose Lighthouse to the UK’s Lizard Point in 5 days, 14 hours, 21 minutes and 25 seconds. This new speed record for a sailing monohull, which is subject to ratification, shaves 27 hours off the previous fastest time previously set in 2003 by Mari Cha IV (which has since been refitted and renamed Samurai). Read’s media commitments at the 2016 America’s Cup World Series Portsmouth meant he could not be on board for the record-breaking crossing. In his absence, Comanche’s crew was led by Casey Smith. 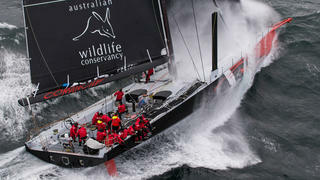 The success of Comanche – the sailing yacht built to win – follows her second place finish at the 2014 Sydney Hobart race. This Transatlantic speed record is just the latest in a remarkable series of records broken by Comanche. The Transatlantic speed record comes 12 months after Comanche set a new 24-hour distance record for monohulls. The record was broken during the 2015 Transatlantic Race after Comanche covered 618.01 nautical miles in 24 hours. Her average speed was recorded as 25.75 knots, on the cusp of some strong southwesterly winds in the North Atlantic. The 24-hour distance record has since been ratified by the World Sailing Speed Record Council. The Transatlantic speed record comes 12 months after Comanche set a new 24-hour distance record for monohulls. The record was broken during the 2015 Transatlantic Race after Comanche covered 618.01 nautical miles in 24 hours. Her average speed was recorded as 25.75 knots, on the cusp of some strong southwesterly winds in the North Atlantic. The 24-hour distance record has since been ratified by the World Sailing Speed Record Council. After she failed to win the 2014 Sydney Hobart race on her maiden regatta, the first half of 2015 saw Comanche come into her own and deliver in every conceivable way. In an April showdown with a fleet of some of the world’s finest sailing yachts at Les Voiles de St Barth 2015, Comanche established a speed record in the Maxi I class with a time of 2 hours, 33 minutes and 4 seconds, taking all line honours in her division. After she failed to win the 2014 Sydney Hobart race on her maiden regatta, the first half of 2015 saw Comanche come into her own and deliver in every conceivable way. In an April showdown with a fleet of some of the world’s finest sailing yachts at Les Voiles de St Barth 2015, Comanche established a speed record in the Maxi I class with a time of 2 hours, 33 minutes and 4 seconds, taking all line honours in her division.